Meadowbrook Park is located in Urbana in Champaign County (Illinois). It represents a significant effort of the Urbana Park District and many volunteers, individuals or from other organizations, to restore a portion of the city to the original prairie landscape.The park is known for displaying local artists' work. It is a destination of many that seek retreat from everyday busy life: families with children, dog owners with their pets, bikers, runners, rollerbladers, couples, nature lovers, photographers, even occassional musicians playing in the evening. Many common prairie plants grow here. Shooting stars and wild hyacinths, spiderworts, foxglove beardtongues, gentians, milkweeds, mountain mints, obedience flowers, white indigos, compass plants, cup plants, prairie docks, rosinweeds, purple coneflowers, greay-head coneflowers, goldenrots, and many more. Depending on the time of the year, you may see the prairie bloom in white, yellow, purple, and blue flowers. If you venture away from the paved trail, watch out for poison ivy. Redwing blackbirds seem ever present, sitting on a grass or flower stem, and if you are lucky, you may see a snapping turtle in the little creek running through the park. Deer is abudant too. The word is still out on how many beavers live at Meadowbrook Park ... some sources say one, others say the single beaver found a mate, yet others claim they are breeding. 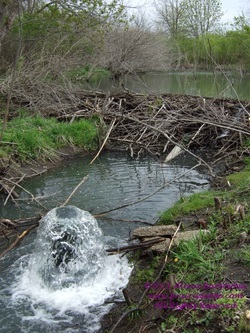 The matter of fact is, there are several beaver dams and plenty of trees down to prove beaver(s) like it there. The Urbana Park District installed an overflow pipe through the dam that maintains an acceptable water level behind the largest dam to prevent flooding and to keep storm drains functioning. 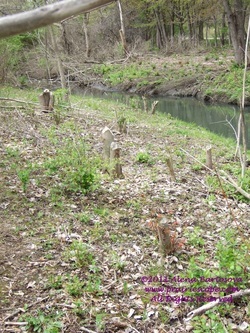 Beavers are nocturnal so don't expect to see them too much but check out the dam and the tree stumps (see photos below). Access: accessible from two parking lots. No.1 is located on Windsor just east of Race St. and is directly by a playground, No.2 on Race St. just south of Windsor and is by organic gardens, restrooms, a water fountain, and herb gardens. Trails: A paved trail loops through the park, at places it connects through sidewalks on Windsor and Race St. There are also several loops through the prairie and alongside McCullough Creek. Others: Urbana Park District organizes special events at the park, most notable the annual Strawberry Jam in June with ice cream and strawberries, bluegrass music, hay rides and other activities. Meadowbrook Park sign with a map and trails. Click the image for a larger version. Meadowbrook Park is a good place for an evening walk. Urbana, IL. Beaver dam at Meadowbrook Park (Urbana, IL). The pipe maintains an acceptable water level behind the dam.